Just how can Lifelot benefit you while you're...alive? Since Lifelot's inception, we have been razor-focused on helping our clients live healthier, fuller and more protected lives. We asked our clients "How can Lifelot benefit you while you're...alive?" From coping with stressful life events to accessing information you need on a day-to-day basis. Being organised is not about being perfect; it's about customising your whole world to work for you...right now. Manage your most sensitive documents from anywhere, and share them with friends, family or even your financial advisor. Things like account numbers, usernames and passwords. Information about treasured items like family photos and secret recipes. Details about who gets the family heirlooms and stories of why those heirlooms matter. All that (and more) in your Lifelot account. Don't have one yet? Click below and let the peace of mind commence. Seven life categories for legacy and end of life planning. Everything broken down into manageable bites, acting as your very own personal database. Online document storage on another level! 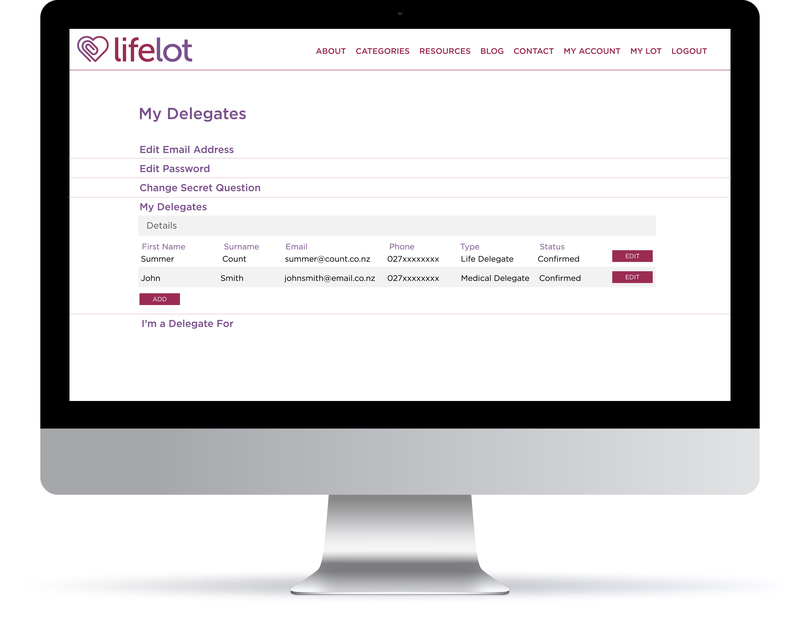 Sort and drop files into any of LifeLot's seven categories. Access them quickly when they're needed - no matter where you are. Taking care of your loved ones means taking care of the medical, legal and financial documents they'll need after you're gone. Templates are editable, printable and free to download. Keep all your personal details here. You can upload identification documents like your birth certificate, drivers licences or a marriage certificate. List your past and current education, employment, pets, your family tree, even a bucket list! Store passwords and login details for all your online accounts and manage digital subscriptions. No more hassle writing, remembering, and resetting passwords. Remember just the one LifeLot password to access all digital security information. Your life's financial information in one secure easily accessible location. Keep track of utility providers, KiwiSaver, insurances, mortgage and loan information plus other ongoing expenses. Record assets and investments, upload receipts to keep safe for future reference and keep all that pesky tax information in one place. Your medical history and treatment records are easily uploaded and accessed here, from allergies to your Advance Care Plan. In the event of an illness or accident, everything you and your family would need is available within minutes, reducing any additional stress that occurs during these times. Enter information about your Will, trusts, Guardians and Enduring Powers of Attorney. If you don’t have a Will you can find a range of templates and contacts here to assist in making it as easy as possible to get one done. As you approach your golden years you will be able to record care providers, the services you use, and keep track of appointments. A place to record your memories, hopes and dreams, leave your legacy and your forever footprint. Record special funeral requests and what you’d like your loved ones to know when arranging your farewell. This ensures less stress for your loved ones in a difficult time.